Most galaxies are either disc-shaped spirals or egg-shaped ellipticals, but there are some oddballs as well, such as lenticular galaxies (kind of a cross between spirals and ellipticals), irregular galaxies (which don’t really have a discernable shape or structure), and extremely-low density galaxies known as ultra diffuse objects. Among these oddballs are ring galaxies—beautiful celestial objects featuring a well-defined elliptical core that’s surrounded by a single ring of stars—and with nothing visibly connecting them. The most famous of these is Hoag’s Object(pictured at left), which was discovered in 1950, and is named in honor of the astronomer who first spotted it, Arthur Hoag. 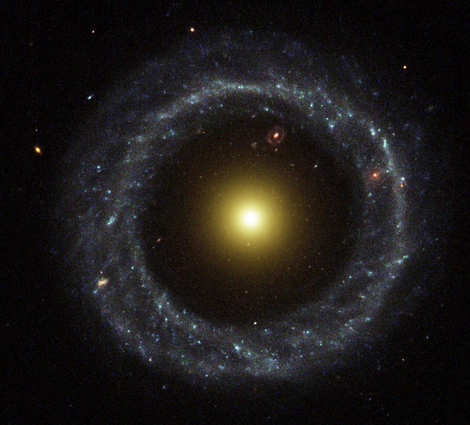 Ring galaxies, also known as Hoag-objects, are exceptionally rare in the universe—less than 0.1 percent of all observed galaxies are Hoag-type galaxies—and astronomers make a big fuss whenever one is discovered. 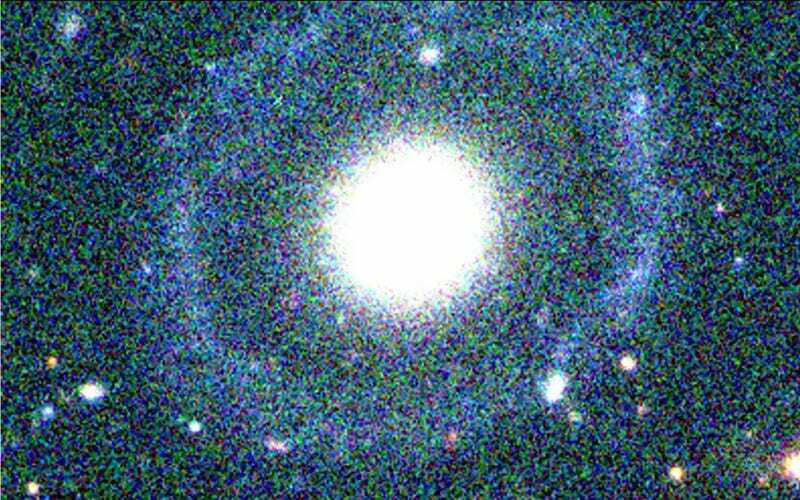 According to a new study published in the Monthly Notices of the Royal Astronomical Society, we can add a new ring galaxy to this very short list—but it’s a ring galaxy that deserves a sub-classification of its own: an elliptical core surrounded by two discernable and independent rings. The object, known as PGC 1000714, or Burcin’s Galaxy (named after the lead author of the paper, Burcin Mutlu-Pakdil), is located approximately 359 million light-years away, and its unusual structure is providing astronomers with unique insights into how galaxies form and evolve. By analyzing multi-waveband images of the galaxy, the researchers detected a blue, i.e. young, outer ring (about 0.13 billion years old), surrounded by a red, i.e. older, central elliptical core (about 5.5 billion years old). Unexpectedly, they also discovered a second inner ring around the central body. “We’ve observed galaxies with a blue ring around a central red body before, the most well-known of these is Hoag’s object. However, the unique feature of this galaxy is what appears to be an older diffuse red inner ring,” noted Patrick Treuthardt, co-author of the study and an astrophysicist at the North Carolina Museum of Natural Sciences, in a statement. Astronomers aren’t entirely sure how ring galaxies form, but it’s possible that their outer regions emerge as the result of colliding gas. 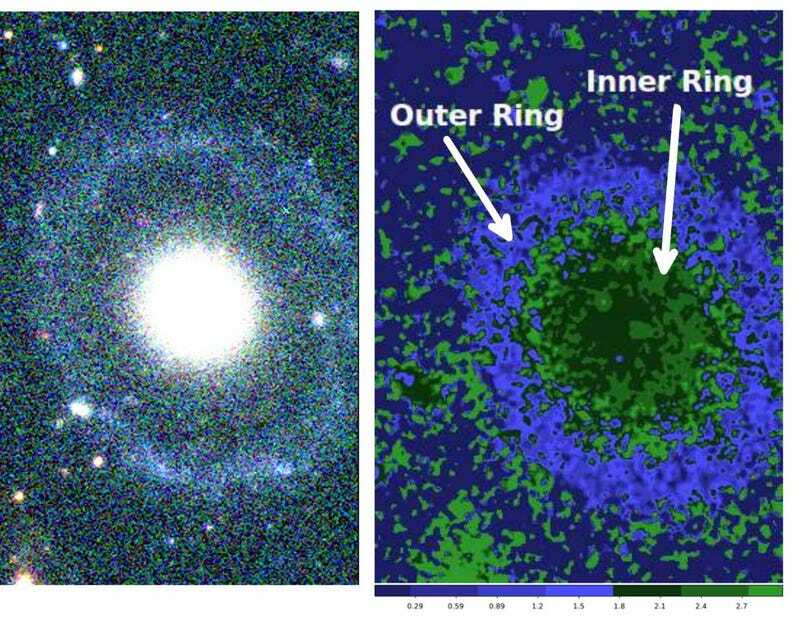 “The different colors of the inner and outer ring suggest that this galaxy has experienced two different formation periods,” said Mutlu-Pakdil. That said, the researchers believe it’s practically impossible to know how the rings of this particular galaxy formed.